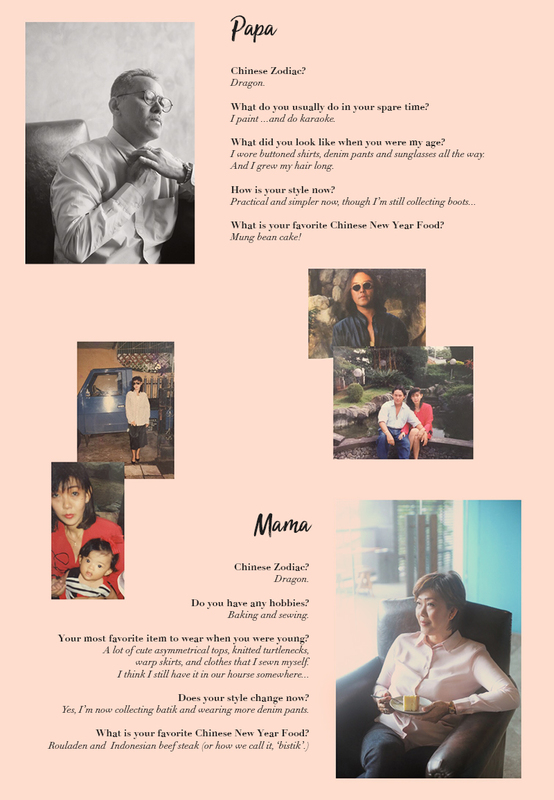 It's almost Lunar New Year and Valentine's Day at the same time, and as I was sitting with my parents I thought when could be a better timing to interview them about the day full of love (and luck! ), ask them about their personal style, and do a laid back photo shoot with them. My mom and dad was never the matchy-matchy couple, so this time I dressed them up in a pastel color coordinate outfits, while I wear the more daring color coordinated pieces (but still going for Dad's oversized red sweater because I choose comfort over everything) which I can use for both Lunar New Year and Valentine's Day. 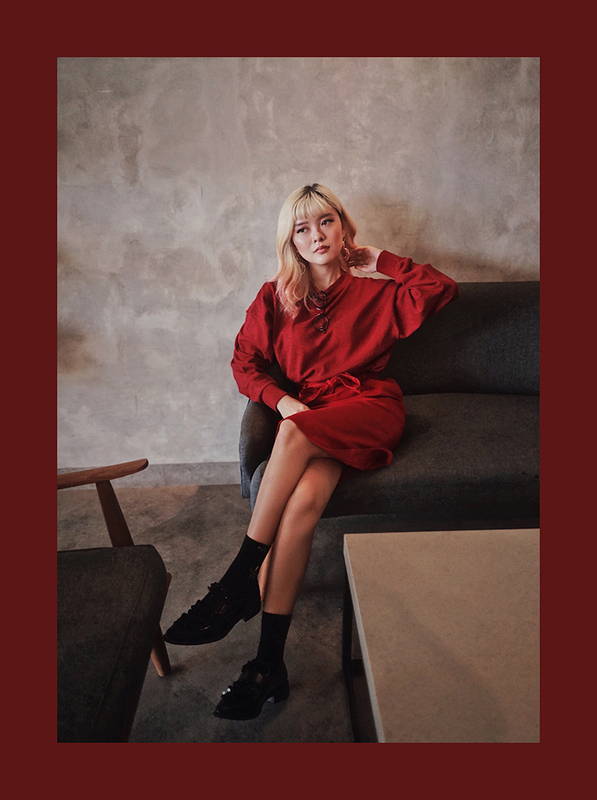 As the Chinese New Year celebration is strongly identical with luck, I managed to do a little research and channeling my inner feng shui master to find out of what is the lucky colors to wear on the big day, and the answer is: red, yellow, green, followed by warm earthy colors like orange, beige or brown. So if you're not really a fan of bright red or your hipsterity tells you to not be twinning with everybody else in red, you can go ahead for calmer tones on the day. On usual days, Mom wears more pants than skirts and is a pretty simple person when it comes to dressing up. While on her younger days, her favorite go-to outfit would be oversized buttoned shirt, turtlenecks, asymmetrical wrap skirts, and a pair of heels, or as I imagine the combo would be: très chic. Before you wonder why the sense of simplicity is never in my DNA, it might be because my Dad is the experimental one. He wears anything that's on trend, the weirdest graphic shirts, and owns any pair of boots and leather jackets you can think of. A fun fact, my mom has always loved sewing, and when they were young they used to design leather and denim pants together... So it's official that I'm a balanced mixture between both of them. 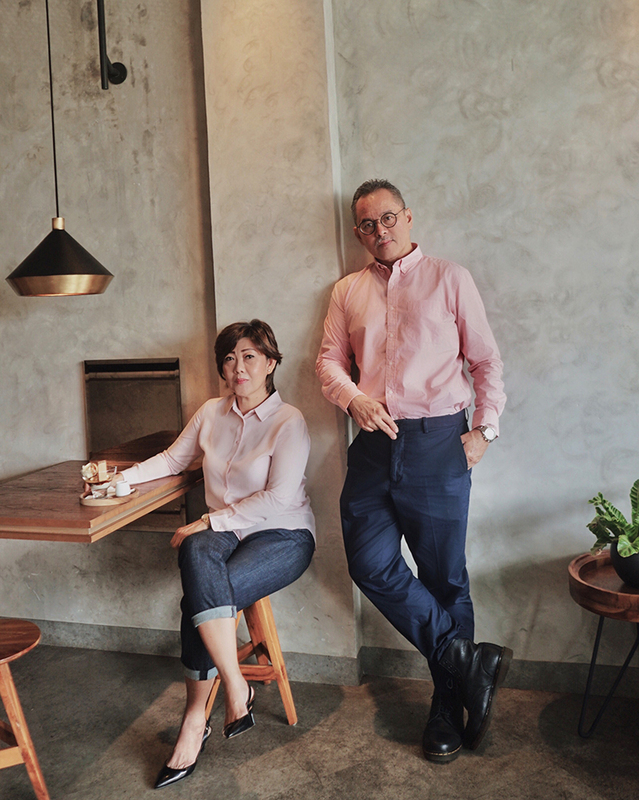 Mom, Dad, and my wardrobe by Uniqlo. Here are some more suggestions I picked on what to wear for a chic Lunar New Year outfits! Great post, Ci! You're a very interesting mix of your parents!